My dog, Cookie, is wild for zucchini. Also cauliflower, broccoli, kale, and cabbage. You could say that my pup has a healthy appetite. This morning, I left a slice of zucchini bread on my desk where I thought she couldn’t reach. Then I heard some scuffling, followed by some gobbling. She swiped that slice of bread and ate half before I could grab it. This dog is my soulmate, I tell you. I captured it on video, if you’d like to see it. That was all to say that this zucchini bread recipe is Cookie and Kate approved. 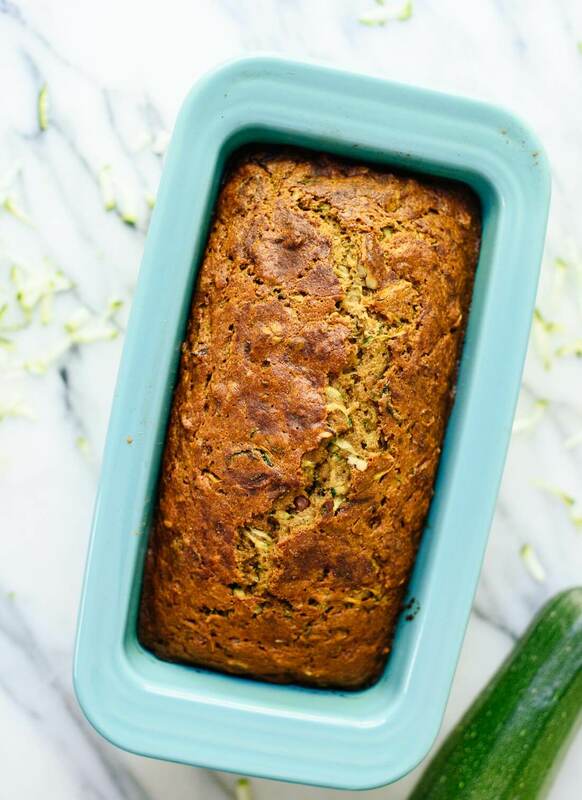 It’s fluffy and moist, lightly spiced, and full of confetti-like green flecks of zucchini. I used one-half cup honey (or maple syrup) instead a full cup of white sugar. It’s not overtly sweet, but you could add another drizzle of honey or maple sweetener to individual slices, if desired. I also used white whole wheat flour instead of refined flour, so this bread is made with 100 percent whole grains. I used coconut oil instead of butter, which means this bread is easily made without any dairy at all. Most zucchini bread recipes call for one cup of grated zucchini, but I liked mine better with one-and-a-half cups. Even then, I can’t say there’s a pronounced zucchini flavor to it, because zucchini doesn’t have a ton of flavor in itself. It’s easily made vegan and/or gluten-free, too—just check my recipe notes. Please let me know how this recipe turns out for you in the comments! Your feedback is so important to me. 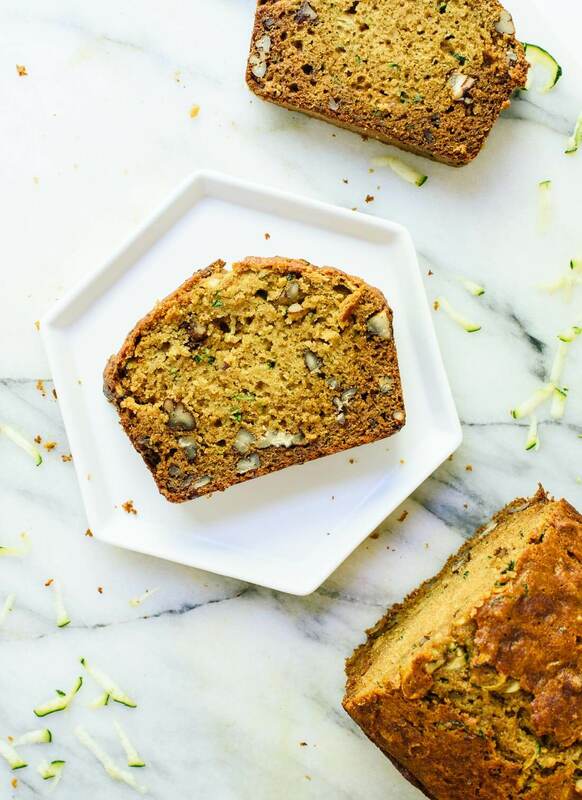 If you love this zucchini bread, you’ll also enjoy my banana bread, apple muffins, carrot muffins or banana muffins, you’re going to love this one. 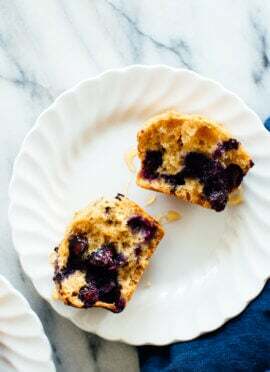 Don’t miss the maple-sweetened blueberry muffins in my cookbook! Preheat oven to 325°F. Line a small, rimmed baking sheet with parchment paper for easy cleanup, and grease a 9” x 5” loaf pan to prevent the bread from sticking. 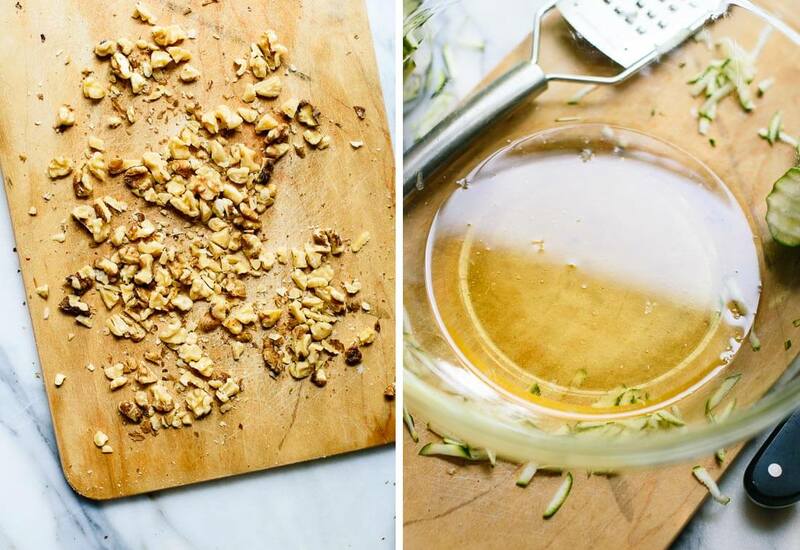 Once the oven has finished preheating, pour the chopped nuts onto your prepared baking sheet. Bake until the nuts are fragrant and toasted, about 5 minutes, stirring halfway. Add the milk, baking soda, cinnamon, vanilla, salt and nutmeg, and whisk to blend. 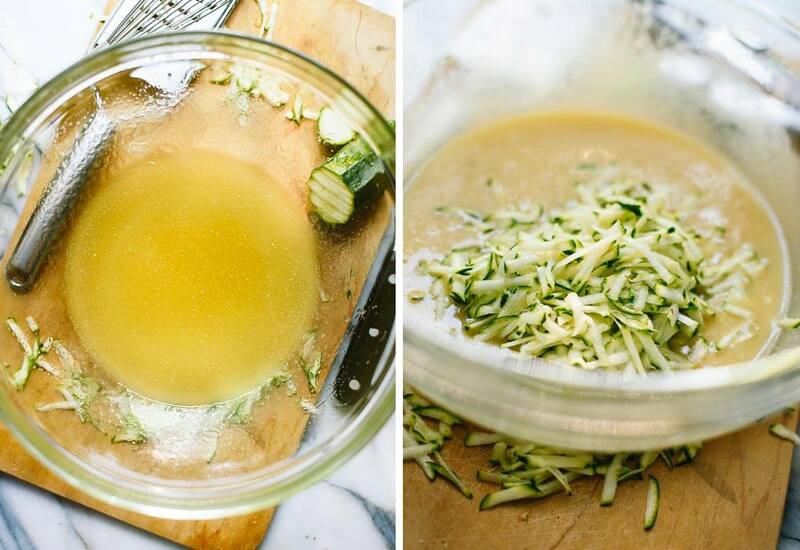 Switch to a big spoon and stir in the zucchini, then add the flour and stir just until combined. Some lumps are ok! Gently fold in the toasted nuts now. Pour the batter into your greased loaf pan and sprinkle lightly with additional cinnamon. If you’d like a pretty swirled effect, run the tip of a knife across the batter in a zig-zag pattern. Bake for 55 to 60 minutes, or until a toothpick inserted into the center comes out clean. Let the bread cool in the loaf pan for 10 minutes, then transfer it to a wire rack to cool for 20 minutes before slicing it with a sharp, serrated knife. Recipe adapted from my banana bread and carrot muffins, with reference to Once Upon a Chef and All Recipes. *A note on oils: I love coconut oil here. I used unrefined coconut oil and can hardly taste it in the final product. Olive oil will lend an herbal note to the bread, if you’re into that. Vegetable oil has a neutral flavor, but the average vegetable/canola oil is highly processed, so I recommend using cold-pressed sunflower oil or grapeseed oil if possible. Make muffins: Follow this recipe! Make it vegan: Use maple syrup instead of honey, replace the eggs with flax eggs and choose non-dairy milk (I used almond milk) or water. Make it gluten free: I haven’t tried myself, but I have heard from a reader that Bob’s Red Mill’s all-purpose gluten-free mix worked well here. 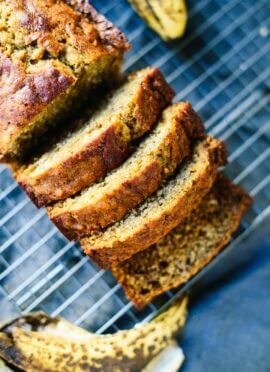 If you love this recipe: You will also love my pumpkin bread, banana muffins and pumpkin muffins and banana nut scones! Recommended equipment: I am totally in love with my Fiesta Loaf Pan in turquoise (affiliate link). I thought this recipe was very tasty. Can you send me the nutritional information because I am on Weight Watchers. Many thanks! Hi Marie! The nutritional information is below the notes section of the recipe. You just need to click to expand. I love your recipes, today, however I tried to double your zucchini bread recipe and added chocolate chips, I had to cook it for an hour and 1/2 as it was so watery. I let it sit for an hour and it was a bowl of jello in texture so had to throw it away. I wonder what I could have done to improve on it being too moist. 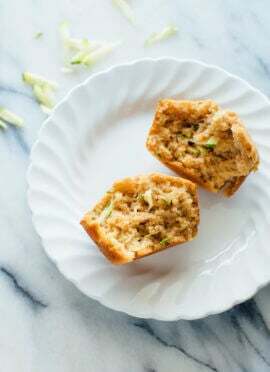 I’ve made many versions of healthy quick breads, but this one was just b a d. Triple checked my recipe and checked again after i tasted it, and I followed it correctly. The texture was too gooey for me, even tho it was completely cooked through (and I had drained my zucchini ornament access moisture as well). Bummer. This bread is sooooo good! Moist and delicious. My husband and I loved it! Thank you for this excellent recipe!! Great to hear! I’m glad to hear an applesauce substitution works well. Thanks for the review! I plan n making this recipe and the pumpkin recipe. Since we are also watching our sodium and sugar intake, I would also like to see the nutrition info on these two recipes. Finally recipes for two veggies that I have plenty of! Thank you. Hi Susan! The nutrition information can be found under the recipe notes. Just need to click to expand. I hope this helps! Nice lightly sweet loaf that turned out very moist. Next time I might try adding a few dark chocolate chips/chunks. Thank you for letting me know your experience, Marni! I had some yellow summer squash from a co-worker and I used that to make this recipe. It turned out great. Not too sweet, but just enough. Thanks, I now have many individually wrapped snacks for when I want baked goods. Love it and cannot wait to try your other recipes. You’re welcome! Be sure to report back when you try other recipes, Karen. I love to hear about your experience. If I wanted to make this into a “cake” (as a healthy version of a cake smash for my daughter’s first birthday) can you recommend a pan size and/or time difference on cooking? Hi Sara, so sorry that I missed your question earlier, and I’m afraid I’m too late for the party! But you can turn this into a cake if you bake it in a 9″ square pan. I’m not entirely sure on timing but I would suggest using this recipe as guidance. I followed the recipe as is except used one large egg and one flax egg and 1.75 cups of zucchini. In my oven, it needed about 12 extra minutes of cooking, but cooked thoroughly without over cooking the top. Wow, we loved this recipe. My nutrition app gave this recipe an “A”! Thank you for sharing! An A! I will take it. Thanks, An! This recipe was awful. No flavor, the honey doesn’t show through, and the recipe should have explicitly mentioned too design the zucchini of all juices. I’ve been baking the heck out of this bread and it’s still gummy in the middle. I’m sorry to hear you had a poor experience with this recipe! Can I use un-sweetened vanilla almond milk? If so, does that change the ratio of how much syrup/honey I should put in or less vanilla extract? You can use that if you like. I’m not sure how strong the vanilla flavor is in your almond milk, but you could consider reducing the vanilla. I would keep the maple syrup as it’s unsweetened milk and it helps some with the moisture. Hope this helps! You are my go-to food blogger! 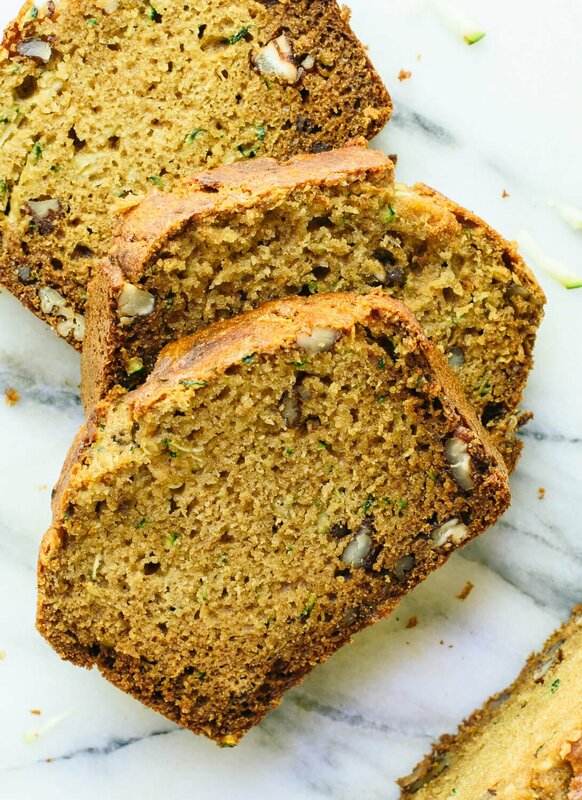 This was so yummy(I’ve made pumpkin and banana bread with your recipes and they were great as well) I cut the honey down a tiny bit because I am feeding it to my toddlers but my husband and I like the amount you set. Well thank you, Amy! :) You’re so sweet! Thank you for sharing and for your review. I never leave comments but feel compelled to for this recipe. It’s excellent! It also holds up very well. I froze it and sliced off pieces for a whole week for my snack at work. 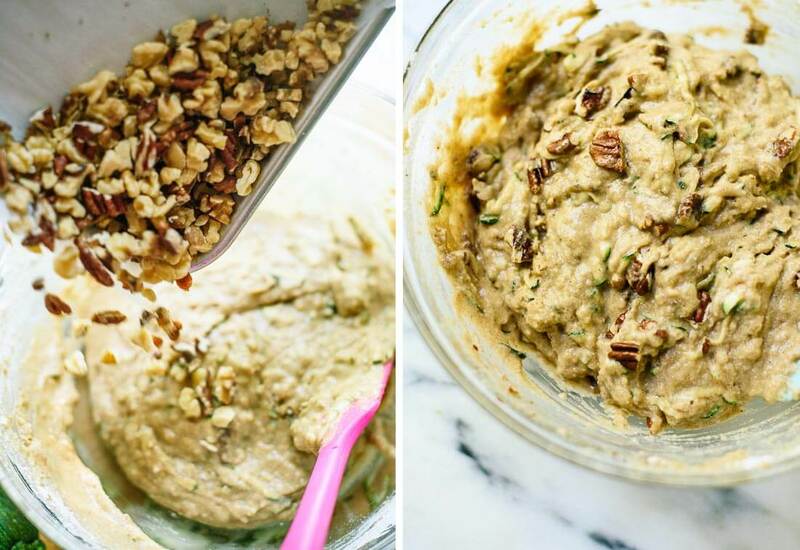 It smells amazing and all of the nuts make it even better. When I made it I ran out of whole wheat flour and had to use mostly white, but I am excited to make it again with just whole wheat. I searched the internet and this one is by far the easiest and healthiest combination. Thank you! Thank you for sharing, Carolyn! I really appreciate the review. This recipe is terrific. So moist and tasty!!! I used about 1-1/2 cups of shredded zucchini, whole wheat flour, and coconut oil. Hah, found your recipe for the zucchini bread. Thanks again!! Let me know what you think of this one too, Debra! This recipe worked great for us. We used olive oil, 1/4 c sugar free honey and 1/4 c sugar free maple syrup so it didn’t taste too much like either, and regular whole wheat flour. Our diabetic neighbors loved it and so did we. Not good. The bread turned out gummy and even with extra baking time the bread was still uncooked. Have wanted to make this for some time. Finally got to it during the holidays. Made it with coconut oil. Was in the oven for 1.5 hours and still a bit under done seeming but I took it out anyway. An hours rest and it was tasty and popular with everyone. 6 hours after coming out of the oven it is delicious, the outside a little crusty and the inside super moist. Definitely making this again!!! Thank you for the fantastic recipe. So, the bread’s in the oven right now! I’m so excited to try it, but I did make some changes to the recipe. I used virgin, cold-pressed, organic coconut oil, raw, unfiltered honey, raw, organic pepitas (nut allergy! ), 1 1/2 tsp. cinnamon; added freshly grated nutmeg (about a tsp.) ground cardamom, ground ginger, cloves, and I replaced the 2 tsp. of vanilla extract with lemon extract to brighten up the whole loaf due to my own love of spices LOL! Finally, I added a total of 3/4 cups mix-ins: 1/4 + 1/8 cup each of dried, organic, unsweetened, unsulfured dried pineapple and organic, unsweetened shredded coconut. I also upped the overall baking time to 75 minutes b/c of the mix-ins, but I’ll be testing at 60 minutes to make sure everything’s okay. I can’t wait to try your wonderful recipe, Kate! Thank you so much for it! What did you think, Alex?! It was absolutely delicious! The whole loaf was gone within a day; in fact, I only got one slice of it! I did end up baking it for the whole 75 minutes (I forgot to check at 55 and see how it was progressing), and it was drier than I had thought it would be given the abundance of mix-ins and rather old baking soda that didn’t allow for much rise, however, that didn’t take away at all from the flavor one bit. Thank you for such an amazing recipe that was an absolute joy to make and eat, Kate! Tried this recipe worked very well. I am not too fond of coconut oil so used olive instead . Added some ground linseed also. Turns out very well. I like it! I almost didn’t make it after seeing some of the negative comments, but I’m glad I didn’t listen. I used fresh picked zucchinis and olive oil, and served with some mascarpone. I’m glad you made it anyway and loved it! What a lovely recipe! Omitted nuts due to allergies, used chocolate chips, coconut oil, maple syrup and whole milk. Came out divine!! Susan, that’s very strange! I hope it turned out ok. You might want to invest in an oven thermometer to verify that your oven is working properly. Other culprits could be forgetting to use leavener or mixing them up (using baking powder instead of baking soda, in this case). Would it be as easy as adding cocoa to make it chocolate flavoured? I believe some have tried that and it’s worked nicely for them. Hi. I was very interested in this recipe. I did read through the comments and noticed your comment on where to find the nutritional information. Unfortunately when I click the nutrition information….theres nothing there. Is there any way I can get this information in your reply? Thank you. Hi Deedee! It’s showing for me. Make sure you have cookies enabled in your browser as this is a plug-in. I hope this helps! I made this recently and it is perfect ,cooked for 55minutes in a fan forced oven.I put sunflower kernels on the top and did add some turmeric to the mix.It also toasts very well .Love this recipe will definitely make again .Going to try your banana muffins now.